2019-04-08 at 15:54 This is my setup link. You might want to look into the method that uses your web browser like this one link , because it uses an html sheet that you can open with notepad and customize to make it look more like something you'd want to use. It also shows all the previous lines and has a line counter at the top corner, so it's easier to backtrack, or measure your reading speed. Now is also a good time to bring up how there's actually different dictionaries and mouse-over tools out there. Rikaichamp is used in my screenshot and it's the fastest one there is, but it uses jmdict/edict which some don't consider the best one out there. Another tool I have, Yomi-chan, can use Kenkyuusha 5th edition if you have it, which is the most accurate one there is, but it's copyrighted so you're supposed to buy it. The disadvantages are that it's a bit slower because I have to click on the window and hold down the shift key to look up stuff, and that there's some sort of stupid glitch where it doesn't work if I start firefox by opening my html sheet, but it works on new tabs I open. That's the only reason why I still use Rikaichamp sometimes, in case I forget to start up firefox BEFORE opening my html sheet and I'm too pissed about it to restart it. Jmdict isn't as good as Kenkyuusha because it makes you think that different pronunciations of the same kanji are synonymous with one another in some words like 描く, when in reality there are actually slight differences. On the other hand jmdict is probably better in that it has more expressions and idioms than Kenkyuusha does. If you really want me to I can watch the whole thing to see if you're making any mistakes translating it on the go, apart from that one person's comment. I didn't like the free grammar guides out there, so I used textbooks for a while and googled more obscure grammar concepts later. That might be why you have a few dislikes, I don't know. 2019-04-08 at 21:38 Don't teach others how to hookcuck. You'll lead the sheep astray. 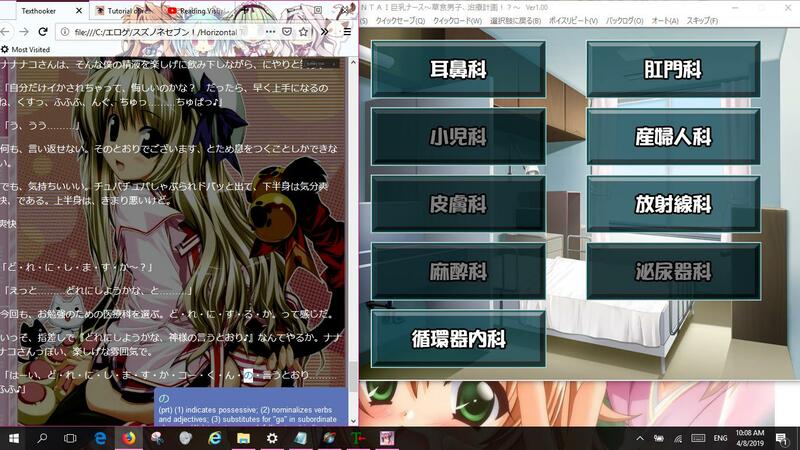 2019-04-09 at 13:51 The struggle reminds me of trying to read a VN without a subtitle(yeah, it was a thing) for the first time. Not sure why did I put such effort in retrospect, lol. 2019-04-09 at 15:57 I watched a few snippets of the video. The main point of a long demonstration like this appears to be to demonstrate accessibility to those thinking of trying untranslated VNs, but who haven't yet committed. A message of accessibility might actually be more effective coming from someone with little JP knowledge rather than someone who is fluent, since it's closer to the perspective of the target audience and therefore more relevant to them. Critics seem to be focusing on his knowledge of Japanese (or lack thereof), rather than that concept of accessibility or the tutorial's utility as a starting point for getting into text hooking (which can be useful for even advanced learners who are nearly fluent). 2019-04-11 at 03:25 #7 I agree.